It’s time to dust of the ring and have ourselves a battle. Typically my battles have been between high and low end models. In those cases, the better model was obvious, and the battle was more about which car delivered the better value. But not this time. This time both cars are priced about the same, in the $30 range. In the silver corner we have the Huracan from Bburago. You may also see this come in a Maisto box, as mine did, but it is branded Bburago on the bottom of the model. 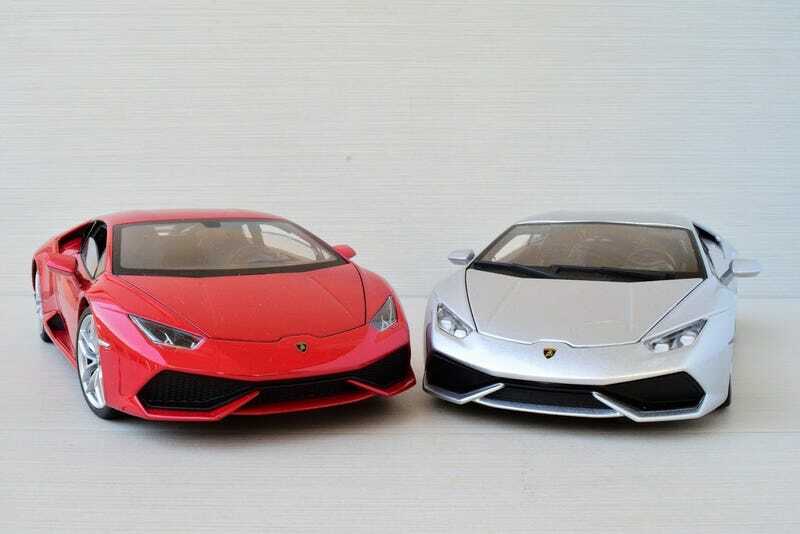 In the red corner, we have the Huracan from Welly. Welly is my favorite budget brand at the moment. If you were to look at their models by release order, you can see a pretty constant rate of improvement. The magic word for this comparo is “crisp.” Both models deliver the expected goods, but the Welly has a crispness to the details that the Bburago lacks. Starting with the paint, both models are equally glossy and both have more than their share of orange peel. But the Bburago’s paint is so thick that it dulls the molded in panel lines of the body. Grills on both cars are sealed, but the Welly’s are cast deeper and pull off the look a bit better. Welly and Bburago chose different wheel designs for their models, and while the Welly has a tad bit more detail, they are close enough to call a tie. However the brakes are a different story. Both models feature rotating rotors and fixed calipers, but the Bburago’s are set so deeply within the wheel barrel, you’d think the Huracan had inboard brakes. The story inside is the same as the outside. Both models capture the look, but the Welly is better detailed. This is especially noticeable in the HVAC and audio controls. The Bburago gives you the overall outline of the button panels, but the Welly has each individual button molded in. The biggest detractor of the Bburago for me though are its overly pronounced surface textures. Both models feature a passable representation of the Huracans engine, but whereas the Welly is an obvious plate motor, the Bburago looks like it may have a full motor. A peek through the rear wheel provides a glimpse of what appears to be an exhaust header. Though you’d have to disassemble the car to be sure, I’m impressed that Bburago didn’t cheat in an area that would have been easy to do so. Also, yes, the engine bays are different, but I found photos of both configurations. So there you have it. 2/3 go to Welly, so Welly is the winner. It really wasn’t close, as the Welly is better in areas that I didn’t touch upon in the interest of not making this even longer. Also, for those of you looking forward to $15 Maistos at the membership clubs, even with that price difference, the Welly is still the better choice. Now with all that said, anybody want a Bburago Huracan for cheap?